Our week-long 30th Annual Fresh Paint fundraiser ends tonight with the Fresh Paint Gala and Silent Auction! An annual spring event, Fresh Paint includes plenty of spring-themed artwork and activities, from artists painting en plein air on Fresh Paint Day, to the floral arranging workshop “Florals and Fresh Paint.” Today we are looking back on this fun-filled week in anticipation of the gallery’s most vibrant event of the year! Fresh Paint began with beautiful spring weather on Fresh Paint Day, April 22nd. Decorated in bright pink and green, the gallery was the first stop for artists before they went off to paint en plein air in Boston. 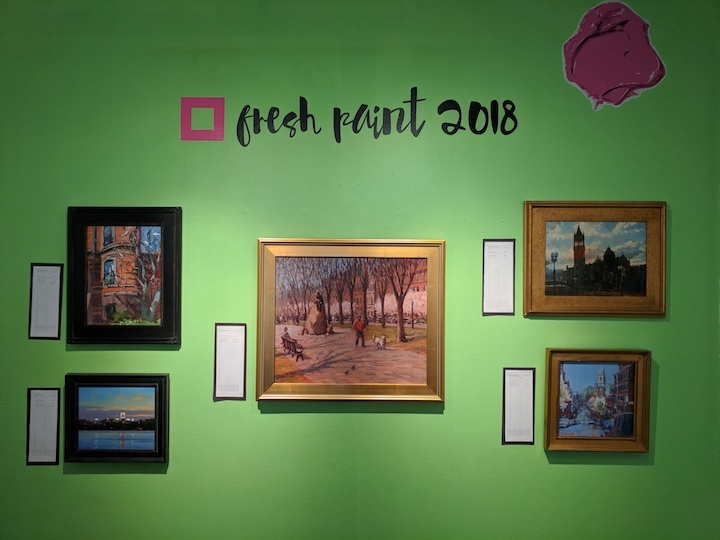 After Fresh Paint Day, gallery staff curated and hung more than 80 paintings in the Upper and Lower Gallery for the Fresh Paint 2018 exhibition. Along with the artwork, staff hung up bid sheets, prizes, and decorative paint splotches to make the gallery festive for the fundraiser. After an exciting week, Fresh Paint ends tonight with our lively gala and silent auction! Tickets for the auction can be purchased at freshpaint2018.eventbrite.com, or by calling the gallery.